Suitable for head circumference 40cm to 46cm. NEW 110cm Tall Durable Child Size Fashion Clothing. Height 110cm. With its realistic features, this Child Mannequin comprises the entire body for a real-life dressing up. Use the Mannequin to display anything from clothes to fashion accessories and everything else in between. Full Body Child Mannequin Child Size Clothing Mannequin With its realistic features, our Child Mannequin comprises the entire body for a real-life dressing up. Use the Mannequin to display anything from clothes to fashion accessories and everything else in between. 53cm high, shoulder: 31cm wide, Chest:23cm wide,Waist: 22cm wide, Hip: 24cm wide. 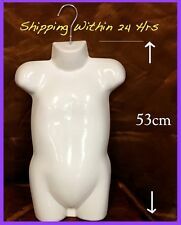 New Gloss Finish Kids Hanging Mannequin Torso With Hook. Hollow back allows you to pin most sizes of clothing to fit the torso attractively. With its realistic features, our Child Mannequin comprises the entire body for a real-life dressing up. Use the Mannequin to display anything from clothes to fashion accessories and everything else in between. The mannequin consists of 4 assembled parts: head, torso with legs, left arm, and right arm. The head and the arms are removable and can be rotated by 360°, and the face can be moved up and down by 60°. NEW 110cm Tall Child Size Fashion Clothing Mannequin. Height 110cm. With its realistic features, this Child Mannequin comprises the entire body for a real-life dressing up. Use the Mannequin to display anything from clothes to fashion accessories and everything else in between. 2 x Mannequin Torso with Stand (Small with Large). - The mannequin is light weight and easy to move around. - Beautiful dress form perfect for displaying dresses, suits, and pretty much all clothing. Kids Child Manikin Head Mannequin Baby Hair Wig Hat Glasses Stand Display 7"
1 Piece Child Mannequin Head. - For hair wigs / hats / sunglasses display, photograph etc. - Head Circumference: approx. - Height: approx. Three mannequin sizes of different infant ages are available. 1 Piece child head mannequin. - Also used for education, hairdressing, and various training. - Head Circumference: approx. 2 Years Old Childrens Dressmaking Dummy Mannequin Torso. - Body Dress Form Mannequin. 1 X Mannequin Dress Form. - Material: Durable Plastic Wood Linen Cloth. 1 Piece Child Mannequin Head. Finger Ring. - For hats / sunglasses display, photograph etc. Jewelry Display. HEALTHY & BEAUTY. Team Sport. - Head Circumference: Approx. - Height: Approx. Foam mannequin - Child Mannequin Head 1 x Child Mannequin Head. 1 x Foam Mannequin Head. - Head Circumference: approx. - Height: approx. - Color: White. 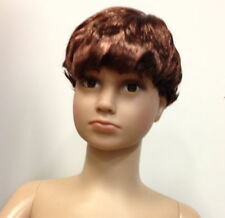 Child Boy PVC mannequin head model. 1 Piece Boy Head Mannequin. - It used to display hats, scarves, hair, hair, etc. - Smooth surface and easy to clean. 1 x Mannequin Torso with Stand. - The mannequin is light weight and easy to move around. - Beautiful dress form perfect for displaying dresses, suits, and pretty much all clothing. 1 piece child mannequin head 1 Piece Foam mannequin. - Child Boy Mannequin Head - Female human face model head - Material: Foam. - Head circumference: approx. - Suitable for showing the hat of children. Kids Child Manikin Head Mannequin Baby Hair Wig Hat Glasses Stand Display 6"
4.5 out of 5 stars - Kids Child Manikin Head Mannequin Baby Hair Wig Hat Glasses Stand Display 6"
16 product ratings16 product ratings - Kids Child Manikin Head Mannequin Baby Hair Wig Hat Glasses Stand Display 6"
4 Years Old Childrens Dressmaking Dummy Mannequin Torso. - Body Dress Form Mannequin. 1 X Mannequin Dress Form. - Material: Durable Plastic Wood Linen Cloth. 1 x Mannequin Torso with Stand. - The mannequin is light weight and easy to move around. (The model can insert needles). - Beautiful dress form perfect for displaying dresses, suits, and pretty much all clothing. 1 Piece child head mannequin. - A set of three mannequins sizes of different infant ages are combined. - Also used for education, hairdressing, and various training. - Head Circumference: approx. Kids / children unisex hip mannequin/ model. 1 Piece Kid Hip Mannequin. - Material: PE. - Lightweight for easy moving and changing. Child Kid Manikin Head 1 piece child mannequin head 1 piece female foam mannequin head. - Female Foam Mannequin Head - Material: Foam. - Head circumference: approx. - Suitable for showing the hat of children. 1 Piece Mannequin Head. - Great for wigs, hats, glasses, headscarf, neck scarf, headphone display. - With base stand, staying stable for convenient use. - Head Circumference: approx. - Height: approx. 1 piece Foot Mannequin. - Good presentation for Jewelry/Ankle Chain/Shoes/Socks, etc. Due to the light and screen difference, the item's color may be slightly different from the pictures. - Material: Plastic. Child Boy PVC mannequin head model. 1 Piece Boy Head Mannequin. - It used to display hats, scarves, hair, hair, etc. - Smooth surface and easy to clean. Don't hesitate to buy, you will get the following item. Cute children mannequin head set. 1 x Boy Mannequin Head. 1 x Girl Mannequin Head. - Suitable for showing the hat scarf of newborn infant. Boy Head Size Girl Head Size - Head circumference: approx.